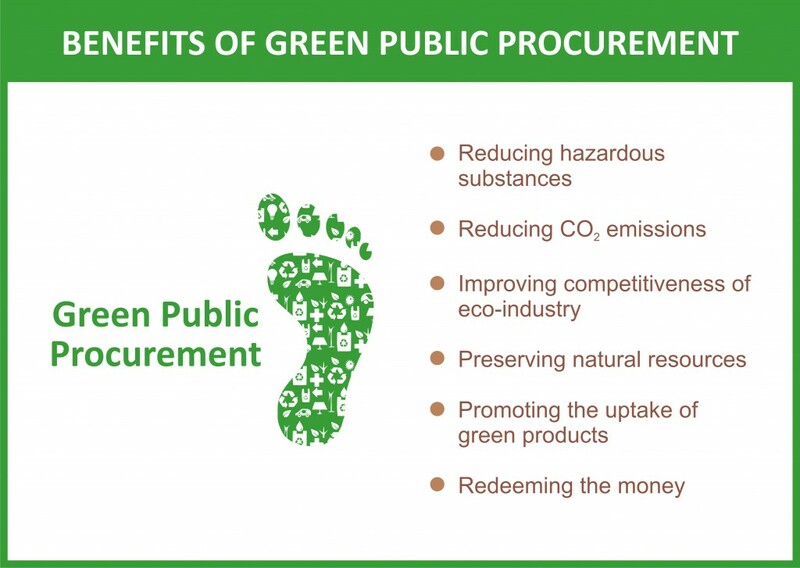 Green Public Procurement (GPP) may be simply defined as “public procurement for a better environment”. Green Public Procurement in other words can also be understood as a process whereby government and its agencies seek to procure goods, services and works with a reduced environmental impact throughout their life-cycle when compared to goods, services and works with the same primary function that would otherwise be procured (Commission of the European Communities, 2008). GPP is fundamentally a voluntary instrument, but it can be legislated. India’s progress, unlike other countries, on taking a step towards GPP has been slow but gaining momentum. Japan already has a law on GPP. In 2000, in South Africa, Department of Environment Affairs adopted a Preferential Procurement Policy under the ‘Preferential Procurement Policy Framework Act, 2000’. In China, from January 2007, provincial and central governments have made a list of environment friendly products certified by China Certification Committee for Environmental Labelling and these products have to mandatorily meet environmental protection and energy saving standards. In Mexico, the 2007–2012 National Development Plan brought in sustainability criteria in the procurement policy followed by a procurement law. The law recognised that all wood and furniture procurement by public agencies requires a certificate highlighting its legal origin and paper procured by public agencies will need to have 50 % recycled content. European Union (EU) adopted two directives on 26th February 2014. Today many of the EU countries have transposed these directives or rules into national laws. These directives support Innovation partnerships where a contracting authority wishes to purchase goods or services, which are not currently available on the market. The procedure for establishing an innovation partnership is set out in Article 31 of Directive 2014/24/EU. Green purchasing is thus about influencing the market. By promoting and using GPP, public authorities can provide industry with real incentives for developing green materials, technologies and products. GPP is therefore a strong stimulus for eco-innovation. This can become a very important game changing feature, especially when the ‘Make in India’ agenda is in full swing. To be effective, GPP requires the inclusion of clear and verifiable environmental criteria for products and services in the public procurement process. Several countries in the world have developed guidance in this area, in the form of national GPP criteria. In India, the Eco-mark label miserably failed. Recently, CII has launched a certification scheme called Green Products or GreenPro to promote products that are green. So far, more than 100 products (mainly related to construction) have been certified. The green criteria used however are not well defined, not easily verifiable and many times ambiguous. My company Environmental Management Centre LLP (EMC) worked with the Ministry of Finance in Mauritius to pilot GPP. The main objective was to develop a Framework for Sustainable or Green Public Procurement (SPP). We developed a SPP Action Plan for Government of Mauritius on this basis. This Action Plan was approved by the Cabinet of Ministers in December 2011. A Workshop was organised with a view to develop sustainability criteria for 5 products as an initial phase. These products included paper, ICT equipment, office furniture, passenger cars, detergents and cleaning materials. A second workshop was held to train procurement officers and hence facilitate implementation of SPP – the participants included both procurement officers and suppliers. Model bid documents were then prepared after training and consultation. Some public sector entities and government departments have started internalising environmental and energy efficiency criteria in their procurement decisions. For instance, Indian Railways, Bharat Heavy Electricals Limited (BHEL), National Thermal Power Corporation (NTPC), and Indian Oil Corporation are promoting sustainable public procurement in a decentralised way in project specific sites with a major focus on procurement of energy conserving equipment in the procurement process of small items. However, such efforts have been undertaken in isolation and have not been replicated or scaled up across organisations, sectors, and levels of governments. Green Procurement related policies may be now seen at Tata Consulting Services (TCS) and Mahindra. These examples are like “islands” in “isolation”. The challenge of making GPP as a common practice still remains. TERI’s Policy Brief provides a good analysis of the situation. In 2012, the Confederation of Indian Industry (CII) carried out a study and came up with GPP Guidelines. The Thirteenth Finance Commission of India emphasised the need for incentivising growth of India with lower environmental and resource footprint. In April 2012, the Union Cabinet approved the Public Procurement Bill, which is currently pending in the Lok Sabha. The Bill aims at ensuring ‘transparency, accountability and probity in the procurement process, promoting competition, enhancing efficiency and economy, maintaining integrity and public confidence in the public procurement process.’ There is hardly any green in this bill, except in Clause 21 where one of the criteria mentioned is “environmental characteristics” of the product. Indian Railways has introduced several green measures and preferences already. Indian Railways now produces modern green three-phase drive locomotives with regenerative capability of producing electric power during breaking of trains along with conventional locomotives. This has been done by forming collaboration with General Electric (GE) and BHEL. Key goods of focus for greening could include ceiling fans, refrigerators, Air conditioners, motors where emphasis could be on energy efficiency and hence reduction in GHG emissions and life cycle costs. Indian Railways has already taken steps in this direction by specifying minimum 3 star energy rating during procurement. These requirements could be heightened gradually as market matures. Introduction of biodegradable bottles for RailNeer, biodegradable paper cups, use of leaf plates etc. could be examples of greening. Indian Railways has already installed Bio-toilets for efficient waste disposal and resource recovery. Paperless e-ticketing has been successfully introduced leading to significant reduction in the environmental footprints. Water is now recycled after washing the wagons and solar energy producing plants & self-sustaining hydro-electric and bio-diesel plants at vacant railway lands are getting commissioned. Indian Railways has already started using Compressed Natural Gas (CNG) in its fleet of multiple diesel units and introduced bio diesel in the sector. Trials have also been completed and one power car of DMU has been converted to run on dual fuel mode using CNG and further proliferation is in progress. Laboratory tests have been carried out by using 10% blend of bio-diesel on Trains that have shown successful results. The only problem is that all these interventions have not been well documented, or third party assessed with metrics to make a strong case for GPP that makes an economic, environmental and social case. We need the numbers to communicate the entire story. Imagine the massive impact of GPP as a pilot at the Indian Railways! A national policy on GPP with operational directives will surely lead to a surge of green product makers and service providers. More importantly, GPP will stimulate innovation and make India globally a competitive country in this aspect. Dr Prasad Modak is the Executive President of Environmental Management Centre LLP and the Director of Ekonnect Knowledge Foundation, Mumbai.